The birthday cake is the least of Dan and Steven’s worries when their lives are turned upside down in the course of a few days. Between their mothers, siblings, and assorted friends, they figure out who their true family is and who matters in their lives. My synopsis: Steven and Dan have been married for a year, and their adopted daughter is about to turn one year old. 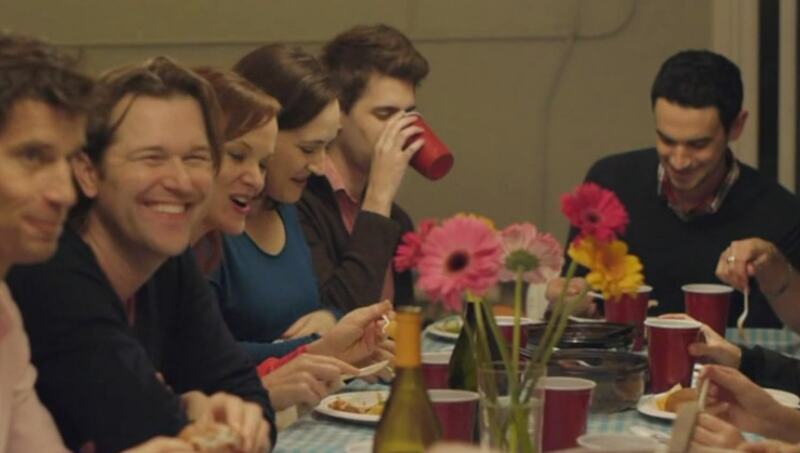 As they film a documentary about their lives, they decide to have a party. But unbeknownst to Dan, Steven has invited his homophobic mother and sister to the party. Steven’s family joins as well as some of their best friends. Of course the mixture of these diverse people causes chaos as does the party itself. When everything goes wrong, at least they know who their family is and who they can rely on to be there for them. At first I thought that Dan’s acerbic personality would drive me away from this movie. 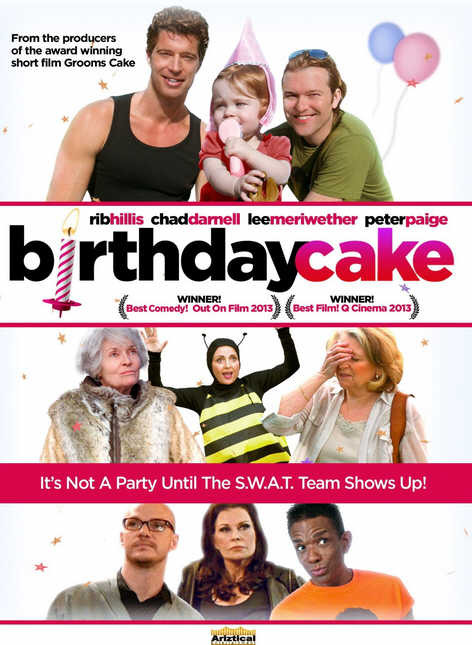 Especially having seen Groom’s Cake and how abrasive he was in that prequel to this film. But somehow he grows on you like a flower grows on a prickly plant. He is in contrast to Steven’s optimistic and personable qualities. In this movie universe opposites attracted and somehow stayed together like magnets. Dan has some issues with running away. His mother even calls him out on it reminding him that he’s been “running away since high school.” It’s a pattern with him to avoid dealing with things whether it’s physically running away or turning his piercing wit to them to fend them off. But there is a scene where Dan appears to have feelings in place of the caustic sarcasm, and he is able to relate to his mother and see her side of the story. It’s like a cactus shed its thorns so it could be cuddled. Steven’s family turns out to be just as full of issues. His mother goes on a virulent diatribe about all things hateful to Steven and his family. It’s really quite amazing the horrific things she says. And the fact that Steven can hold his tongue is even more amazing. The party is quite over the top. Not just the plans for the petting zoo, clown, and bounce house, but the insanity that occurs. It’s like a kids birthday party turned into the zombie apocalypse. Between dead clowns, dead baby cake, and the murderer in the backyard, I’m not sure it could be any worse. One of the main themes here is family – both given and chosen. Our families have this connection with us that can be the source of so much love in our lives or it can be the origin of pain. And they can surprise us. Then we can make the people around us into our family. As they say in the end of the film, “Find the people that make life interesting, that lift you up, support you, love you.. and that you life up and support as well.” And when all things go wrong, you know who you can count on to be there for you. I thought this film would be either too full of catty wit or just over the top crazy, but it turned out to be be deeper. The theme of family and it’s strengths and opportunities is offset by the humor and craziness that surrounds the couple. It’s fun to watch and pulls at your heartstrings at the same time. Next Oy Vey! My Son is Gay! !